ImTOO iPad Video Converter is specifically designed for iPad users to watch just about any file format on the iPad. Not only can this iPad video converter convert general video (AVI, MPEG, WMV, DivX, MP4, MOV, RM, RMVB, ASF, 3GP) and audio formats (WMA, RA, AC3, OGG, APE, MP2, CDA) to iPad video (H.264 & MPEG4 & MOV) and audio formats (MP3 & WAV & AAC & AIFF) respectively, it can also convert high-definition (HD) videos including AVCHD (*.mts, *.m2ts), H.264/MPEG-4 AVC, H.265/HEVC to iPad 720p H.264 HD video so you can enjoy HD movies on your high-resolution iPad wherever you go. Convert HD videos to iPad 720p H.264 HD video. Supported HD video formats include AVCHD (*.mts, *.m2ts), H.264/MPEG-4 AVC, H.265/HEVC, MPEG-2 HD, MPEG-4 TS HD, MPEG-2 TS HD, Quick Time HD, WMV HD, AVI HD, etc. Just about any HD video and general popular video format can be converted to iPad H.264/MPEG4/MOV video. Extract audio from videos and convert them to iPad audio (MP3, WAV, AAC, AIFF); convert all popular audio formats to iPad audio. Make full use of your multi-core processor by converting files using all cores for maximum speed. Convert videos to iPad supported formats at up to 5x faster speed with NVIDIA CUDA & AMD APP encoding technology. One step to convert and transfer various videos to iPad or iTunes, easy and fast. Adjustable aspect ratio (4:3 and 16:9), CD decoding, resizable player and power management are supported. Multithreading and batch conversion enable you to convert multiple videos to iPad videos/music at the same time. 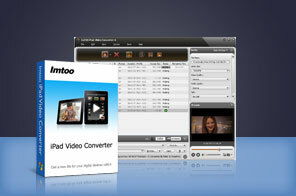 ImTOO iPad Video Converter provides conversion profiles with optimized output parameters to suit your iPad exactly. Adjust a variety of output parameters: bit rate, frame rate, sample rate, channel, codec, aspect ratio, and many others. Auto split a file into several parts by setting split size/time. Convert any part of a video by specifying its start time and duration. Output multiple format files from the same file. Define the output file size with the corresponding video bit rate computed instantly using the Bitrate Calculator. Preview video and capture movie images from it. Automatically switches your system to shut down, hibernate, stand by, exit application or do nothing after a conversion is completed. Set the iPad Video Converter to work in the background to spare CPU resources for other applications. Language interfaces to choose from: English, French, German, Spanish, Japanese and Chinese. Tutorial : How to use ImTOO iPad Video Converter? Transfer/backup/copy videos, music, photos among iPads, computer, iTunes, iPhone, and iPod. Convert DVD to iPad video and audio files easily. Convert Blu-ray movies to iPad video format. Download and convert YouTube videos to Apple iPad video and audio files perfectly. How to download and transfer movies to iPad? How to play WMV video on iPad? How to put videos/movies on iPad, play videos on iPad? DivX to iPad: How to convert DivX to iPad video format? AVI to iPad: How to convert AVI to iPad video format?